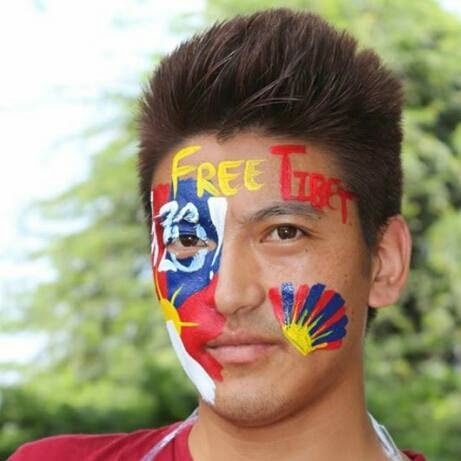 Gyaltsen, gearing for a free Tibet protest. My cousin brother, Lobsang Jamyang, self-immolated for Tibet in 2011. Several months later, Lhapa Kyizom, a Tibetan journalist from Voice of America, came to my school with a video footage of my cousin brother. She asked me if I was mentally prepared to watch it. I told her I was ready even though, I was not. I think no one is ready to watch their loved ones burning alive. Subsequently, she took out an iPad from her bag and left it opened on my lap and went outside. Probably, as I could feel, she understood how hard it was for me to watch my cousin burning. I played the video. I saw before my eyes, though how unimaginable could it be, the fire was consuming my cousin from inside and outside; the cousin with whom I had spent my childhood years--joking around, sharing laughters and the cousin who is a big part of my childhood memories. Later, one of the witnesses of the fiery incident told me that the fire was coming out of his mouth while he was shouting slogans for Tibet. While the fire was burning him, the fleshes were chopping off in pieces on the ground. But he was still calling for Tibetans to reunite. After several attempts, the Chinese policemen dragged him down, but he again stood up in much bigger, much wilder flame and kept calling for Tibet! The fire and pain had already taken away his tongue and throat; nevertheless, the pain of Tibet that he felt inside his heart still kept him calling for a free Tibet -- a better future for Tibet. While seeing my cousin in the flame, I felt as if he was calling for me. However, he was actually calling for all of us. His eyes saw not only his parents and relatives like me, but also, every Tibetan of his blood kind. In his heart, he had felt the pains agonizing the hearts of every Tibetan. Finally, the Chinese armed police closed in, fired teargas into the crowd and then used a pushcart to knock down my cousin on the ground. As he was collapsing down, at both sides, police were seen kicking and beating him in such an unbearable scene! Authorities at the scene then covered him with a white cloth while dousing down the flames, and continued beating him while taking him away. The forty five seconds long video was ended but I felt it was much longer than that. That was the last time I saw my cousin. Remembering his childhood, his enthusiastic face-- childish jokes, funny laughters--appeasing my father for more sugar and even the clothes he wore, ripped my heart apart with tears streaming down, uncontrollably and unbearably. I felt so proud to have such a brave cousin brother, however, simultaneously, i felt an irreplaceable loss for I have lost the greatest person in the history of my entire family tree. Ever since the voluntary, the painful death of my cousin brother, any discussions and commentaries about the self-immolation by anyone, either far or near, stabs my mind automatically, leaving me in a long breath with deep pain. But, actually, I think it causes me more than a sheer long breath. I have been reading about my Cousin from different sites. I noticed many websites have updated a slight misinformation, howsoever, providing similar ideas. But the things that i can't digest are the poor evaluations regarding the effect of self-immolations. There is a common notion in the Tibetan society that these days that the act of Self-immolations is a waste of lives for it couldn't effect on the Chinese government as well as it has failed to grab international support or attention to the Tibetan cause. It is somewhat true, but it is a very one-sided judgement. These evaluations have somehow failed to see the incredible impacts among Tibetans in Tibet which are directly caused by those series of self-immolations. For Tibetan Cause, Tibetans are more important than Non-Tibetans. The positive impact that is happening in our own Tibetan community are more crucial than the supports we get from others. But we ( exilers) are accustomed to stay in sheer hope, expecting other countries, especially western countries to save us. We think reaching out to international communities and countries is the sole solution to our cause. It is very important to seek help, but living solely with hope of help from others results sheer disappointment and it is so because they won't sacrifice themselves for our Cause. Therefore, people in their sheer disappointments, say and feel the self-immolations are waste of lives since it couldn't draw world attention and support. It is important to seek help but giving no consideration to the impact inside Tibet gives even more disappointment. When I look at the impact of self-immolations inside Tibet, I feel we are close to reaching our common goal. These self-immolations and movements induce Tibetans inside our homeland-- an unthinkable patriotism and inexorable spirit of brotherhood. They have finally realized that they have to fight for their own rights even at the cost of their lives rather than expecting someone else to save them. In my opinion, they are probably the bravest men on the planet. No body can stop and force them to surrender because for national defense, they can sacrifice their lives through the most painful mode. Once they are not afraid of burning their lives to death, what else are they afraid of? After these series of self-immolations and movements, the very foundation of Tibetan society has changed and transformed from a religiously bounded-society to a politically conscious force. Our best weapon is unity. Once we are united, we are well prepared to fight. It is not merely Tibetans inside Tibet who have realized how important of what we are and what we have, but also, at the larger angle, they have instilled the courage and indomitable spirit to guard one's nation even at the cost of their own precious lives. This chain of unprecedented series of self-immolations are a wake-up call for our own people and they have succeeded reaching far from awakening. Now, they see what are the core essences which keep a nation alive. They bring back their own children from Chinese schools to Tibetan schools and respect Tibetan teachers more than teachers teaching the language of the colonizers. Those illiterate Tibetan and even the old ones are now started learning how to write in Tibetan language. One of my friends went back to his home in Tibet from India due to some health problem in the school. He later told me that Tibet has changed. Without knowing Tibetan written language, knowing proper English is a matter of embarrassment. So he is also back to a Tibetan university in Tibet, polishing his Tibetan language. Many people say self-immolations are waste of lives. But the real waste of lives are the loss of hundreds and thousands of lives every year in fights among Tibetans, themselves! Every year, in every village of my home town, there used to have incidents of one or two Tibetans got killed by fighting among themselves. Disputes over small patch of lands between two villages used to create disastrous conflicts, which could be solved only after having equal casualties on both sides. But now, there are no more or very less such land disputes and internal conflicts. One of my brothers from Tibet recently told me that all village men in my hometown made an oath in the presence of a portrait of H.H the Dalai Lama, not to fight among fight among Tibetans as well as, many of them vowed not to have meat or drink alcohols. After combining all these dramatic changes of all villages in Tibet, we can actually say that those lost lives of 140 self-immolators have in fact, saved thousands of lives that we lose every year in the several years. The first call of my cousin while he was on fire is "unity". I feel his first message has almost accomplished and now we need to stay strong and keep struggling rather than getting ready to surrender. Putting in a nut shell, I am asking all Tibetans to give a closer look at the changes that are taking place in Tibet rather than merely mourning over the deaths of these 142 self-immolators. If you can see the changes, the socio-psychological transformations inside Tibet, you would, definitely, find them as the greatest strength and hope for our struggle for a free Tibet. NOTE-- Gyaltsen was a high school student, studying in one of the Tibetan Children's Village Schools in Northern India when his cousin brother set himself on fire in Tibet in 2011. Now, Gyaltsen is a student of Delhi University, majoring in English language. That is true but don't you think Beijing actually wants us to jump into a trap like this? I have a whole lot of appreciation for the courageous sacrifices by these self-immolators but at the same time, I believe they would be much more help to our cause if they keep alive and fight. These men and women are the real strength of our struggle, rest of us are just "talkers", just "mourners"-- mourning and lobbying and for many, lobbying has become their career and unfortunately, the career has become the priority. So, in fact, we are just having our career based on the blood, bodies and sacrifices of our brothers and sisters inside Tibet. That is sick and is going to become unacceptable if these lobbyists and activists keep doing like this in the name of doing something for Tibet. I remember Voice of America Tibetan section once telecasted Tsering Kyi's reaction to one of her relative's self immolation, and later on, Tsering Kyi was interviewed by one of the main anchors of CNN. I think VOA should interview this gentle man as well. Regarding selfimmolations, I have no word to express, just in a state of not knowing to cry or laugh, and I think so are many other Tibetans. Absolutely eye opening piece I just read. As young as you are ; Gyaltsen la; your depth to understand the sacrifices made by our brothers and sisters through their self-immolations is deep. You were absolutely right that ; the self-immolations brought the Tibetans globally much closer together with better understanding of our role in Tibet. Their sacrifices have ; thus; never gone wasted, is not going wasted and never will be wasted as long as Tibet survives and the Tibetans are alive to the last one standing solo. But losing our loved ones to such immeasurable and untold human sufferings that more than 140 undertook we wished never had happened did happen . Now we must make their sacrifices work as they were meant to work . That is to awaken Tibetans to realize the importance for us to stay united as Tibetans and bring their message to the world leaders' attention and understanding.So; now we must think , how can we bring their sacrifices to the world power houses realization by asking them to prioritize Tibetan sufferings over economy accumulation where only few wealthy alone can enjoy while the poor continue to suffer in the most painful way they seem not aware of ; that their ignoring so many Tibetans' sacrifices is them being irresponsible to the existing injustice in Tibet . It's a failure of the international human rights and the international court of justice. We live on this planet as they do. They owe it to the world peace of which Tibetans are almost sole contributors .We ; the Tibetans have never stopped fighting for ourselves , for our rights . But ; without disturbing the world of its sleeps. From Tibet ; our homeland as well as from away from home in exile. His Holiness as we all know ; never wasted a moment of His youth for Tibet and the Tibetans back home. While brothers and sisters back home were under the most oppressive regime ; and we in exile weren't certain about the situation back home ; but one thing we were sure that those behind would never give up on Tibet even at the cost of their lives and ; that conviction became life blood to the exilers as you termed . I know ; we all need to do more . But ; we have never not done any time. We kept going and our going is getting better every turn of the calendar . So ; don't be disheartened And; if ever you are ; you be the strength and courage so we come around stronger again. Thank you for the beautifully expressed concern from you. You seem to have every quality that promises to bring Tibet story to the fore. I would like to live with that thought about you in my heart and mind. Be the change you can be. Bodh Gyallo !! !